Prior to flying out for Gamescom 2018, Activision gave Shacknews a chance to go hands-on with Sekiro: Shadows Die Twice, where we died. A lot. Venture to a time where swordsmen, ronin, and samurai warriors clashed their weapons in the name of honor. After venturing into the fantasy realm with Demon's Souls, Dark Souls, and Bloodborne, FromSoftware steps into an entirely new setting with Sekiro: Shadows Die Twice. The land of 1500s Sengoku-era Japan awaits, as Gamescom attendees take their chance to be the among the first to play this upcoming action game. But prior to reaching Cologne, Germany, Activision provided Shacknews with the opportunity to try out FromSoftware's latest. Those familiar with previous FromSoftware efforts should know the drill, in terms of story. The narrative is minimal, with no clear mythos at work. Players step into the role of the unnamed "one-armed wolf" protagonist, who earns his name because of the Shinobi Prosthetic attached to his severed arm. The most noteworthy part of his arsenal is the grappling hook attachment, which is used to bring about a new element of traversal. The grappling hook can be used to quickly go between rooftops, reach new platforms, and complete harrowing traversal sequences. It also complements a mechanic new to the FromSoftware games: the ability to jump. Jumping isn't just used in exploration, but is also a key element in combat. 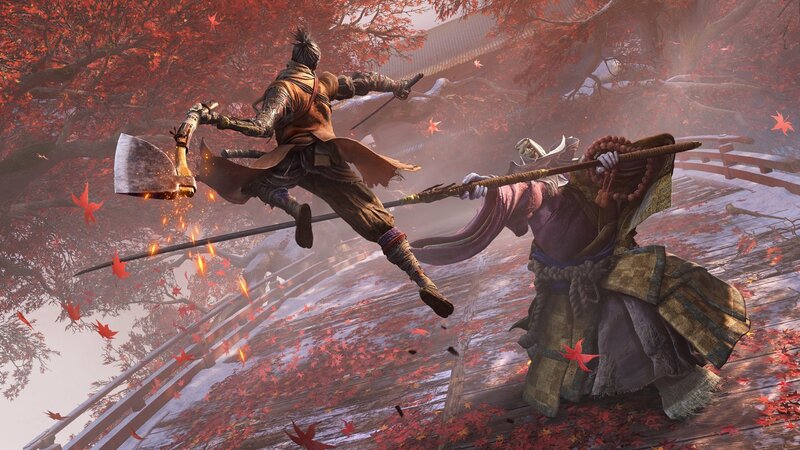 While players can certainly try to approach Sekiro like a typical hack-and-slash game, they do so at their own peril. Enemies will block and parry frequently and cut you down where you stand. The key to success is in going toe-to-toe with foes, making sure to carefully time strikes to parry enemy attacks. This feeds into the Posture mechanic, where the idea is to break the opponent's stance. Successfully breaking the opponent's Posture creates an opening for a Deathblow, a violent one-hit kill that ends the foe in gruesome fashion. Deathblow opportunities also pop up through stealth. One of Sekiro's major elements is sneaking around undetected. Deathblow opportunities will pop up when catching an enemy unaware, either from above, around corners, or underneath ledges. The stealth route is a challenging one, but it's rewarding given the alternative. Getting spotted will often lead to multiple enemies surrounding players, which becomes much more difficult to escape. One scenario saw me surrounded by multiple enemies, along with a giant Chained Ogre. As I tried to ward off the lesser enemies, the Ogre casually picked me up and delivered a powerbomb to put me out of my misery. But this is what leads into the subtitle "Shadows Die Twice." 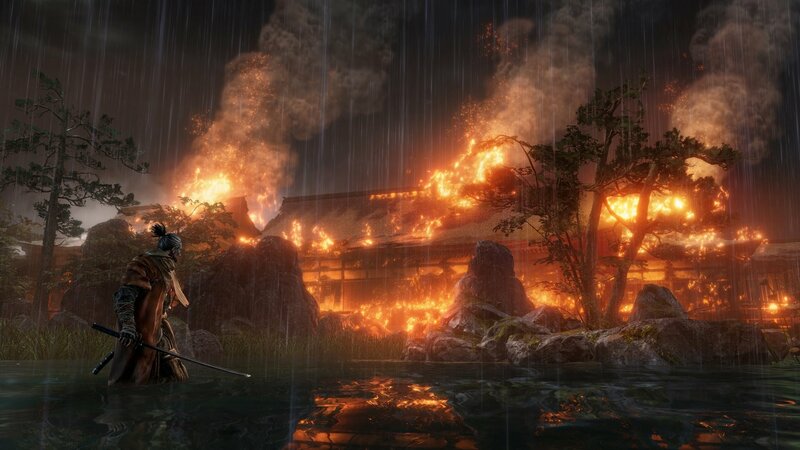 Sekiro utilizes a Resurrection mechanic that allows players to jump back into the action with a fraction of their remaining health. At that point, they can refill their health all the way with the aid of their Healing Gourd or they can fly right back into the fray. The Resurrection mechanic can be refreshed by dispatching enemies, but if it isn't, the player will see the red Kanji character, along with the word "DEATH" in all caps. This is Sekiro's spin on "YOU DIED" and players should expect to see this a lot. There are a few ways players can aid themselves in combat. The Shinobi Prosthetic can utilize attachments, like the Loaded Axe, which can break enemy shields and leave them stunned long enough to deliver a Deathblow. Players can also light their sword on fire to deliver elemental damage, which is how the Chained Ogre was ultimately defeated. While the main method of knocking off enemies is to deliver Deathblows, one such blow will not always be enough. The end of the demo saw a battle with a Corrupted Monk. The start of that battle was a standard one-on-one battle, after which the Monk's Posture was broken and was seemingly taken down with a Deathblow. However, the Monk has multiple health bars and the Deathblow only depleted one. This sent the Monk into its next phase, where she deployed multiple shadows, all of which struck simultaneuously. The Resurrection mechanic was not enough to save the day here. 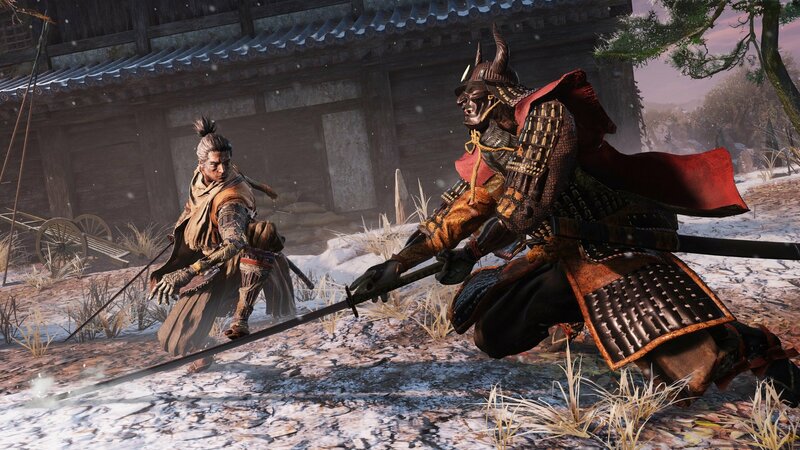 Sekiro: Shadows Die Twice is expected to have many battles like these that will test player resolve and patience. Even with new toys, new mechanics, and new methods of doing battle, this is still a FromSoftware game at the end of the day. It will not be easy, as evidenced by Activision reps pointing out that nobody on the press tour had beaten the Corrupted Monk. But if Sekiro is anything like its predecessors, the eventual scent of victory will be as rewarding as ever. Sekiro: Shadows Die Twice is set to release on PC, PlayStation 4, and Xbox One on March 22, 2019. Nice! Set to release on PC so I guess there's no waiting for a port this time around. Booooooya!